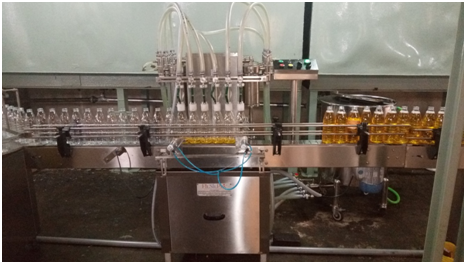 Automatic Volumetric Liquid Bottle Filling Machine works on volumetric principle with diving nozzles. The unit is made compact, versatile and enclosed in stainless steel elegantly matt finish body, consists of S.S. Slat Conveyor, Reciprocating Nozzle with self-centering devices & SS Syringe. No container No filling system arrangement is standard features of the machine. The main drive of the machine and conveyor drive consist of A/c Motor with synchronized variable A/c Frequency Drive. Containers moving on SS Slat conveyor, feed below the filling nozzles through a settable twin pneumatically operated stopper system. The twin pneumatically operated stopper system and reciprocating nozzles can precisely match for centering of container below nozzles, to avoid spillage of liquid on container. To minimize foaming adjustable nozzle will reciprocate according to filling dose, nozzle will go upwards slowly from bottom level of bottle towards neck during filling. The dosing block with a hexagonal bolt fitted below syringes. This means fill size can be easily set. ±1 % Filling accuracy on single dose. Minimum charge overtime, from one size to another container or fill size. Self-lubricating UHMW-PE guide profile for S.S. slat chain provides low friction wear surface, smooth and noiseless conveying. Bottle Stopping arrangement through Pneumatic system. Synchronized two nos. A/c drives for main motor & conveyor belt. Safety guard for conveyor gearbox, motor and pneumatic cylinders. Inbuilt protection against over current, voltage fluctuation, short circuit in A/c frequency drive. Our organization “Filsilpek Solutions Pvt. Ltd.” we has carved a respectable niche for itself as a reliable Manufacturing, exporting and importing of a comprehensive array of Liquid Filling Machine, Filling Machine, Viscous Filling Machine, Sealing And Capping Machine, Labeling Machine, Tube Filling Machine, etc. These machines are extensively appreciated in the market for their indispensable features such as compact designs, long service life, high functionality, hassle free performance, anti corrosive body, robust construction, etc. The machines provided by us are manufactured using the best quality components and innovative technology under the stern vigilance of our dedicated professionals in tandem with industry quality standards. Additionally, we provide these machines in numerous technical specifications at rock bottom prices.